A faint pink line on Jim Holley’s chest proves he’s more than a husband, father, grandfather, woodworker, cyclist and moose whisperer. 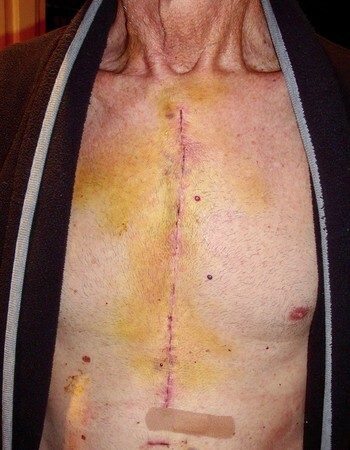 He’s an open-heart surgery survivor who was given the best care he could have hoped for. His journey to Methodist began at birth. Jim was born with a bicuspid aortic valve, in which the aortic valve has two cusps or leaflets instead of three. It’s a condition that normally doesn’t affect individuals until later in life, and that was certainly the case for Jim, now 72 years old. In 2013, it was discovered that Jim’s aorta was growing in size – a condition that would need regular and careful monitoring. Five years later, he went in for a routine CT scan. His aorta had grown significantly. While a normal diameter is less than 3.5 centimeters, his was 5.3 centimeters. At risk for an aortic rupture, Jim needed valve replacement surgery – and soon. The thought of open-heart surgery terrified Jim. 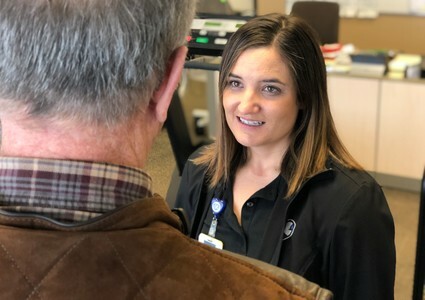 But his cardiologist, Dr. Edmund Fiksinski with Methodist Physicians Clinic Heart Consultants, put his mind at ease with his calm, collected and confident demeanor. Dr. Thomas Langdon with Omaha Thoracic & Cardiovascular Surgery was Jim’s surgeon at Methodist. He barely left him with a scar. 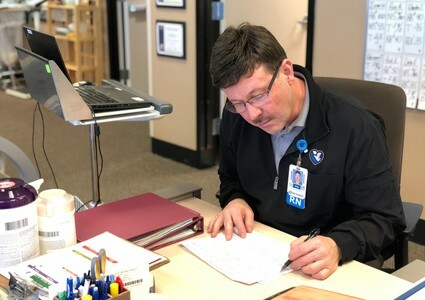 “I remember looking in the mirror after my surgery and thinking, ‘Gosh, other than this light incision line, you’d never know I just had such a critical surgery,’” Jim explained. Jim also credits those who work in the Cardiopulmonary Rehabilitation Unit at Methodist Hospital. 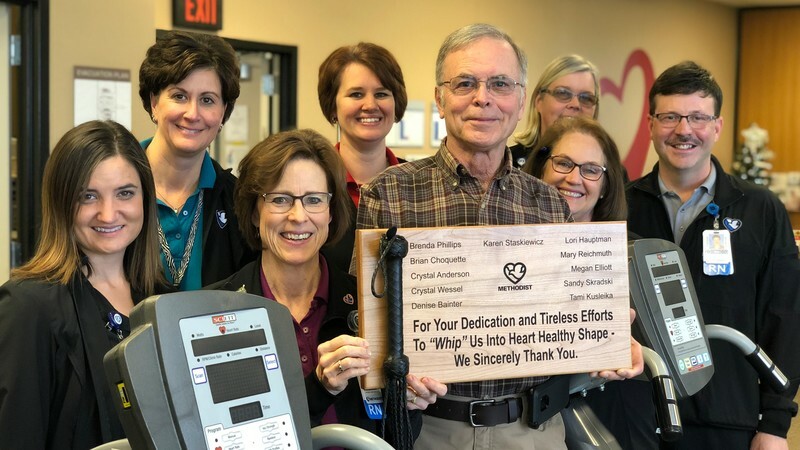 He attended 17 cardiac rehab sessions, with staff members tracking his every move. An avid cyclist, Jim was no stranger to exercise. Still, his rehab program was challenging and comprehensive. “It was clear they had expectations, and they wanted me to meet them,” Jim said. It was also clear they had a desire to get to know him. Jim became close friends with much of the rehab staff, including Megan Elliot, BSN, RN. She made it a point to learn about the things that really matter to him. Not long after rehab, Jim made it back to the Bighorn Mountains in Wyoming – a place his wife introduced him to years ago. While back in Wyoming, he felt good. 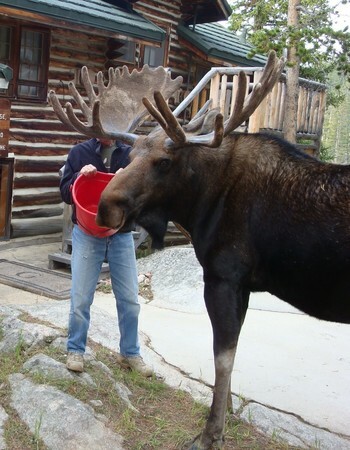 He had the strength and stamina to feed his moose. Jim realized that a stronger heart meant more life to live, which meant many more trips to the mountains. For that, he felt the urge to say thanks. 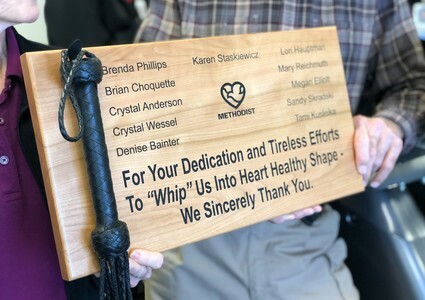 With his sense of humor and appreciation for woodworking, Jim decided that a personalized plaque with a play on words was the best way to express his gratitude. Attached to the plaque? An actual leather flogger whip – something that made the cardiac rehab team erupt with laughter until Jim turned the plaque around. 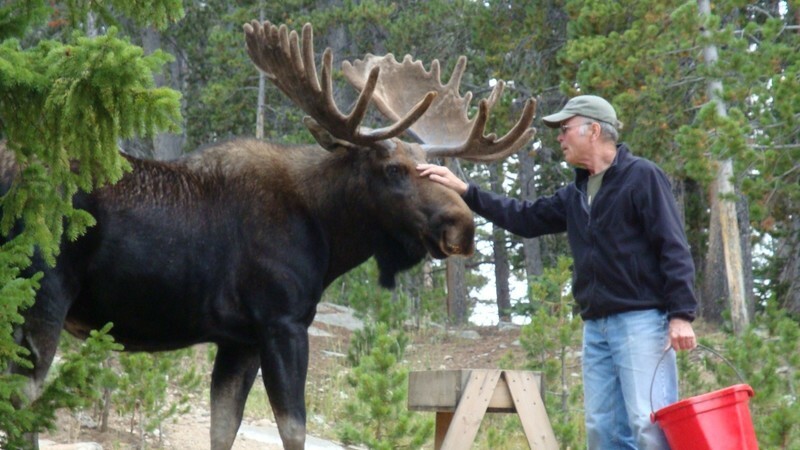 That laughter turned into silence and heartwarming smiles when the team saw that Jim had even “signed” the back of the plaque with a photo of him with his moose. It was evident that seeing them again was something else he needed, too.